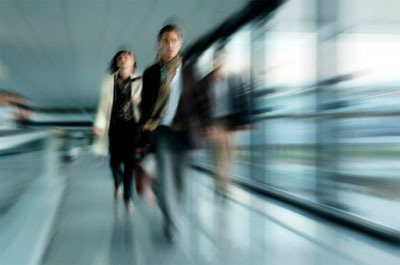 Welcome to our June 2011 design newsletter! By now you probably have a clear idea that branding your business is very important. But when a new client approaches your business, they will also communicate with YOU and your people who are a continuation of your business's branding. Today I'd love to introduce a fascinating person I've met recently. 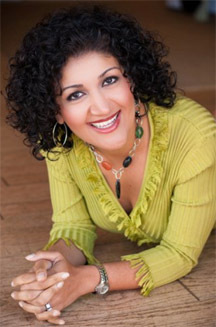 Katy Goshtasbi helps business owners to extend their company's branding onto the people in the business. 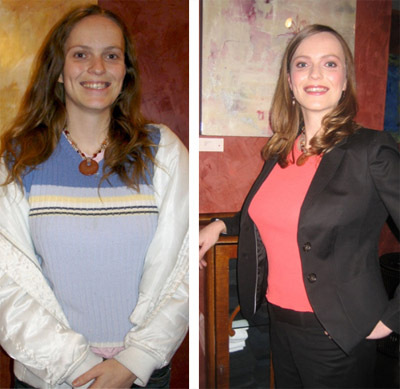 See some amazing before and after images of her clients! 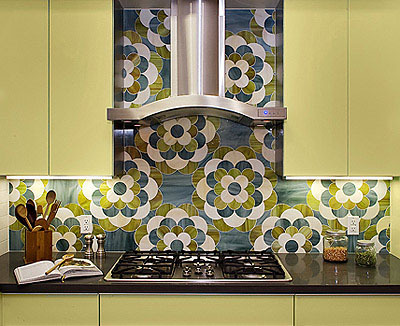 In our Green News corner, take a look at a green tile which expands your imagination in design! We all know about the importance of having an effective working environment. The choice about how you and your staff shows up to represent your product or service at your client's location is also yours. Katy Goshtasbi thinks that "an effective personal brand starts with the understanding of who you are as a business owner and an individual. Without this solid foundation of a sense of self, it is not possible to build an effective personal brand that then translates into effective business branding." When I met Katy we automatically clicked on a personal level because we do the same thing but from a different angle. I help companies to brand themselves with interiors and Katy helps business owners look and feel their best. I've asked Katy some tough questions about her work process and most importantly the process of measuring her success with each client. If you missed it, check out the latest trends in Commercial Interior Design of 2011HERE. Katy, what are some Red Flags that someone needs to revamp their image as a business owner? - The biggest bottom line sign is that business has slowed and revenues and sales are down. This symptom directly correlates with poor self-confidence, morale, and performance with respect to the owner and the staff, if any. Most often business owners and staff don’t know who they are and thus, can’t establish an effective personal brand to then sell the business brand. Just like how our interiors and surroundings affect our energy and performance, so does how we show up each day visually and how we choose to communicate with our prospects and clients. Katy and I help clients in similar area - rebranding their looks. 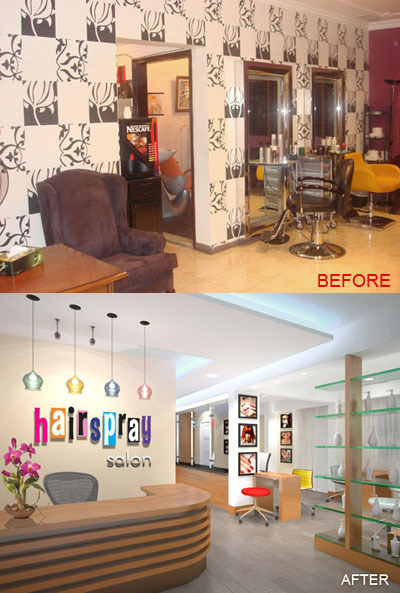 We also get to see amazing transformations on before and after images like this hairs salon above. - I always ask what their personal branding goal is for themselves. Without a goal and intended results, it is impossible to achieve success. I also ask them what their number one personal branding issue is and what is taking up their thinking time. The more time we spend in our head instead of creating our business realities with others, the less we are out in public connecting with our clients and prospects and the less effective our personal brand. How would you know that your branding mission accomplished with a business owner? It's easy with interior but how do you know its done when you work with a person? - We take a base-line survey before we begin with respect to self-confidence and revenues and then we take the same survey at the end of our work with clients. I often don’t even need the final survey - I can see the progress clearly with clients and they always see results in terms of self-confidence, revenues and business growth a few weeks into our work together. We also like to do “before “ and “after” photos so clients can visually see their transformation and have professional headshots to use elsewhere. One of Katy's client's before and after photos. Click HERE to see more before and after photos. - We work with small business owners on their personal branding. With corporations, we are hired in for multiple reasons. One, if a corporation is shutting down or laying off staff we go in to transition the staff out of their jobs - we establish a personal brand for them, boost their self-confidence, develop their natural talents and work on their resumes, interviewing styles so that they can find the right jobs or develop new careers. Two, we go into growing companies and work with 4-5 executives/upper level management to help them define their personal brand, understand the corporate brand, and transfer that personal brand successfully into the corporate brand so they can then represent the company well and increase their success within the company. If you would like to learn more about how to brand your business, take a look if you could use this book - "Branding By Interior" by Ekaterina Kohlwes. We are all used to seeing tile as square or rectangular cut pieces, but look what can be done with tile if you involve a bit more imagination. All of it sudden that tiled wall becomes an art piece! These tiles are made of recycled aluminum and the oil used to heat up the metals during production is recycled car oil. Read more HERE.